So so happy to see that our new Diamond Latitude and Longitude Necklaces have already appeared in style guides! 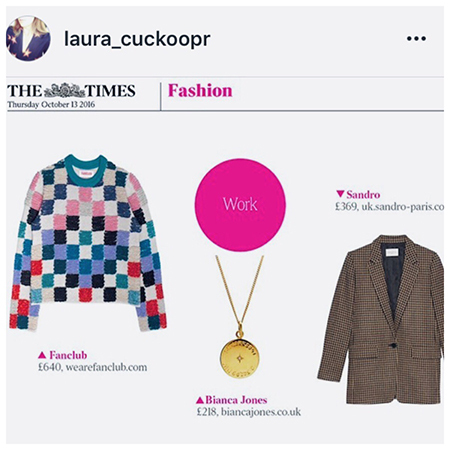 Spotted our new piece feature in The Times Fashion Guide, in the ‘Work’ edit. And this necklace is certainly a go to statement accessory to make your work outfit look that extra bit chic and stylish, but at the same time still remain understated. The Diamond Latitude and Longitude Necklace is available in all three precious metals, sterling silver, 18ct Yellow Gold Vermeil and 18ct Rose Gold Vermeil, to suit all preferences of jewellery. This necklace is the perfect solution if you were looking for a personalised necklace that is a lil more unique than the standard monogram personalisation of jewellery that has taken the jewellery trends by storm. Hand engraved with the co-ordinates of a location that is special to you, that will leave people wondering what the numerical coding on your necklace reveals. If you are gifting this necklace to someone special, why not get the latitude and longitude coordinates of somewhere that you both share a treasured memory, so she can be reminded all day, every day, carrying the memento around her neck always. The Diamond Latitude and Longitude Necklace could mark the first place you met, a holiday, wedding location, your honeymoon or perhaps just simply home… where the heart is! Make these memories all the more special knowing that the coordinates have been determined by the celestial heavens above, thousands and thousands of years ago, when explorers travelled by starlight. Latitude and Longitude coordinates were first created thousands of years ago when travellers relied on the sun and eclipses of Jupiter’s moons to reveal the secret of their exact location. Diamond Latitude and Longitude Necklace by Bianca Jones Jewellery, the ideal personalised necklace for the one you love most.